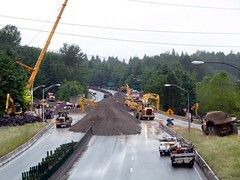 The landscape around Highway 520 near our home has dramatically transformed as the Washington State Department of Transportation proceeds with several projects leading to the replacement of the bridge over Lake Washington. As trees come down and culverts are placed, a lot of dirt has been displaced and archeologists are actually on the scene here and over at Seattle’s Alaskan Viaduct project looking for artifacts. They don’t expect to find valuable relics, but the garbage of earlier generations serves as an informative record of history. The WSDOT has given $342,000 to the Burke Museum for space to store the collected objects which could shed light on the lives of workers in the logging and fishing industries which ruled the area before airplanes and then computers came along.